I’ve been fighting a headache for three days now. Grass and ragweed are trying to kill me now that Fall is almost here. Yesterday, through a blinding afternoon headache I wrote down a few words on scratch paper about writing. I think about writing a lot (obviously, because I’m a writer). But yesterday, I felt overwhelmed. I still hadn’t prepared for the Reddit Author Spotlight on Sunday. In fact, I hadn’t even signed on to Reddit, and I felt overwhelmed by the fact that there was a whole new pond of social media for me to swim through. Work ALL The Time because the work is meaningful. Work ALL the time, because without writing down my thoughts I might implode. Work ALL the time, because when I don’t I feel lost and restless. Market my material, because I want others to share in my creation. (WOW-that sounds like a God complex, right?). But isn’t that what all writers want? Someone to have an emotional reaction to their work. Someone to say, “This book is amazing–when is your next one coming out?” Without marketing, there would be no readers. My goal is to have my readers recommend my book to other readers–that should be your goal too, if you’re a writer! Stay up on social media so I can continue to market my work. Also to get to know other writers who feel the same struggles as me. Social media helps writers create social networks for when the going gets tough. Like when they’ve received their 100th query rejection and feel like tossing aside the old pen–fellow writers can help their literary companion down from that cliff. Editing – This one is my hardest, but editing my own work has allowed me to become a better writer. I’m pretty darn good now at picking out the mistakes, rewording, cutting characters, etc. And editing is the best way to make a good piece really shine (or to figure out that your piece is crap and move on to the next much more worthy project). This all leads to readership and a sense of accomplishment for the author. Creative ideas aren’t a problem for me. I have new ideas for fiction pieces before I’m ready to have new ideas! In fact, I start stories and then see which one carries me all the way to the end. Creative ideas help writers sort through issues or problems in their lives without doing something crazy or destructive (at least this is true for me, as writing is cathartic for me). Writing allows me to organize my thoughts so they don’t drive me batty! Earning peanuts – not much good to say about this, except I don’t know a single author who got into this business to make money. Most authors started writing because they felt compelled to. Yes, making money would be nice, but it’s not the be all and end all of writing. The be all and end all for me is the story, the readers, the connection, and what we leave behind when we’re gone. 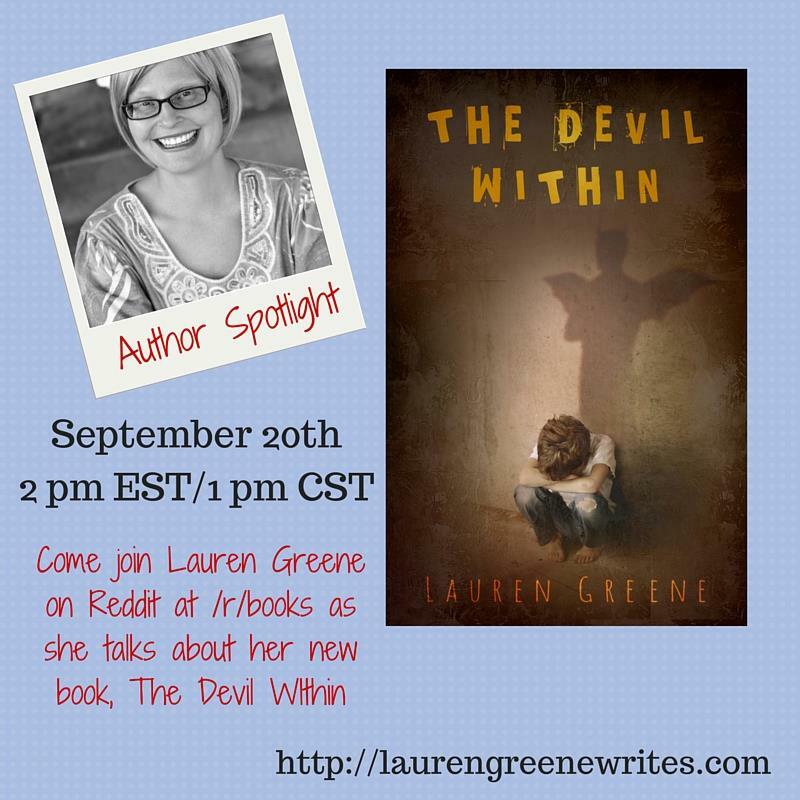 Sunday, September 20, 2015, I will be doing a Question and Answer session on The Devil Within over on Reddit! Make sure you stop by to ask me a question! Great pod, Lauren. When you broke down the ideas of what a writer should be doing, it doesn’t seem as overwhelming. It’s hard nonetheless, but not impossible.